Should You Let Your Cat Run Outdoors? 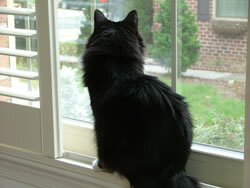 One of the main pleasures for some cat-owners is watching their cat enjoy the outdoors. After all, cats are the ultimate hunter. They are genetically engineered for lying in wait, stalking, and pouncing on prey in the wild. They can entertain themselves for hours engaging in hunting behavior. 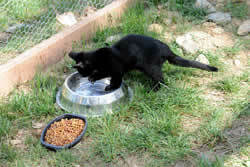 But this “natural” side of cats leads to many problems – with neighbors, the law, and with hazards to the cats themselves. Should you let your cat run outdoors? Isn’t it cruel to deprive the cat of fresh air and exercise? 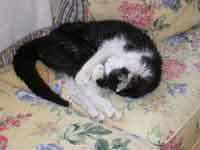 Let’s look at some of the things that can happen to your cat while he or she is outdoors. He could get hit by a car. Maybe he will survive the injury and maybe he won’t. Maybe he will be able to come home injured and maybe he will lie somewhere suffering for hours before anyone finds him or he dies of his injuries. Maybe you never will find his body and never know what happened to him. He could get caught and mangled in the fan of a neighbor’s car in cold weather. Maybe the worst that happens is he loses the end of his tail. He could get poisoned, either accidentally by pesticides or poisonous plants or intentionally by someone annoyed by his presence on their property or on their car. He could get chased by dogs or other animals and killed or get hopelessly lost. He could get stolen, even by someone who would sell him for research or dog-fighting. He could get shot by hunters or by children with BB guns. Your cat might only be wounded and die much later of starvation or exposure. He could get caught in a leg-hold trap to die a slow and painful death. He could get parasites such as ticks, fleas, or worms. He could be exposed to heartworm disease via infected mosquitoes. He could be exposed to serious diseases such as feline leukemia virus, feline immunodeficiency virus from fighting with other cats, or even rabies from exposure to wildlife. He could cause problems with your neighbors when he uses their lawn for his litter pan or hunts small animals and birds which they enjoy on their property. 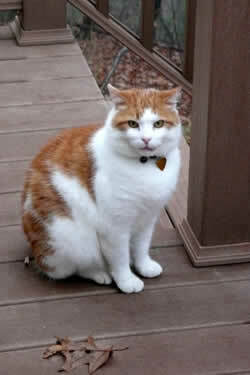 He could get “taken for a ride” by a disgruntled neighbor who is tired of dealing with your cat on his property. Many local governments have ordinances which require pet-owners (of dogs and cats alike) to keep their pets on their own property. 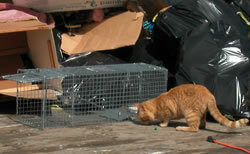 Cat-owners know that the most effective way to keep a cat on their own property is to keep it indoors. Considerate cat-owners realize that their neighbors have rights, too. A cat kept at home cannot possibly leave scratches on the neighbor’s car, tear open his trash bags, dig in his gardens, urinate on his shrubs, or kill baby birds from the nest he and his children were enjoying. A cat kept at home also cannot parade in front of a cat-owning neighbor’s windows, stirring up the neighbor’s cat and possibly leading to a house-soiling problem in his house. Keeping a cat indoors makes good sense for other reasons as well. Breeders and owners of valuable purebred cats do not let their cats outdoors because they know their cats are safer indoors. Would you let a two-year-old play with matches because he enjoys it so much? Of course not! Yet cat-owners who let their cats outdoors “because they enjoy it so much” are doing the same thing. A cat is very much like a two-year-old child because it is capable of doing many things by itself, yet it lacks the judgment to protect itself from man-made hazards. But doesn’t a cat need fresh air and exercise? Actually cats do not need much exercise to keep in shape. Experts believe that the key to their fitness lies in the isometric-like stretching which they do several times a day. 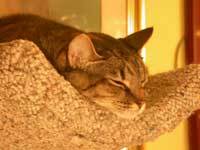 You can encourage your cat to exercise – and provide lots of fun for you and your cat alike – by providing him with a scratching post, or better still, a climbing tree. Other types of environmental enrichment also are available like cat furniture, interactive cat toys like fishing rod types, hiding boxes, catnip, cat-safe house plants, kitty videos and so on. What about cat fences or outdoor enclosures? An on-line search will turn up several makers of cat fences (for example, www.purrfectfence.com, www.catfence.com, and www.catfencein.com). 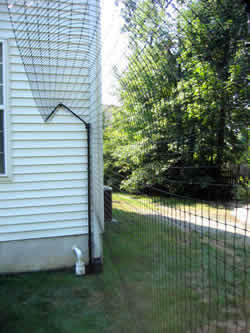 These are enclosures constructed of flexible mesh (like a deer fence) with an angle or arch attached to keep the cat from going over the top. 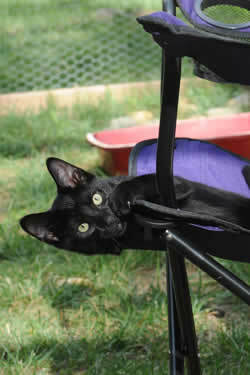 The flexibility alone discourages many cats from climbing the fence. You also can attach an escape-resistant top to an existing fence (see www.catnet.stanford.edu.) 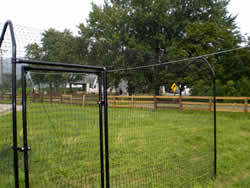 Gates also are available as well as videos on how they work and how to install the fence yourself. Cats can escape from these fences, so it is a bit of a trial-and-error process to get it right. The problem of the cat being off your property is solved by these fences. You still have the parasite problem, however, and the hunting problem. But this is a good compromise if you absolutely have to let your cat outdoors. If your cat does go outdoors, be sure to have him microchipped and vaccinated for at least feline leukemia virus and rabies. Also be sure to use a flea and tick control product. Be a good neighbor and a responsible pet-owner. Keep your cat indoors where he’s safe.